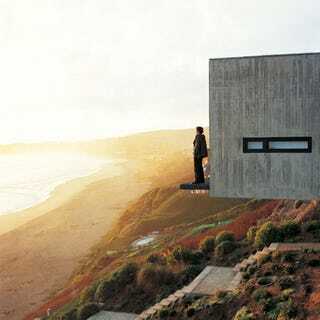 It may not be crazy high-tech architecture, but there's something about this Chilean home hanging over the Pacific that has me glued to the screen with a mixed feeling of complete awe, peace, and envy. The materials, the clean design, the floor plan, the breathtaking views, all of it, make it the perfect place I want to live in. Divided in three floors, Casa 11 Mujeres (House 11 Women, named like that because it was designed for a family with 11 daughters, ages four to twenty) was built with bare concrete with wood floors, glass, and steel on a 45 degree slope looking down Cachagua beach, 87 miles north of Santiago de Chile. The bottom floor contains shared spaces, while the second level has the daughters bedrooms-all overlooking the sea-, and the top floor has the master bedroom, kitchen, living room, and dining room.